Here's another app for Nokia phones which offers you voice modulation app like Talking Tom Cat but still there is no physical actions like Android Talking Tom Cat . Although it lags as comparing to Android's Talking Tom cat but you should know that most of the android -phones are fast due to the fast hardware support to them as compare to Nokia that's why these app runs fast on android. 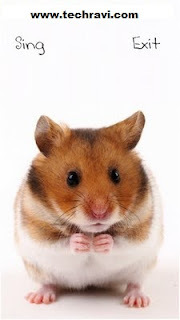 Talking Hamster : It is a Symbian or .sis file based on QT. A very nice app. In this , a Hamster modulates your voice to a more funny voice in real time. It can even sing a preloaded Happy birthday song , It do not perform any physical action , it just speaks.It is a much improved version of Puppy talk, which i already published . So, to remove this error and make this app fast . just place your finger on phone's microphone after speaking anything. It will instantaneously repeats (in funny way) what you speak like Talking Tom Cat. Symbian^3 : Nokia N8 , Nokia E7 , Nokia C7 , Nokia C6-01 and other Symbian^3 devices. First , install QT in your phone,If you already installed QT than download the Talking Hamster in your phone. Please make sure that your QT is updated to latest version for faster response of this app.